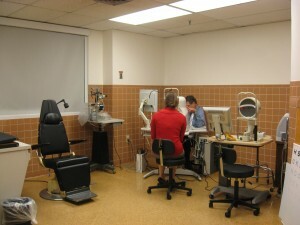 The Department of Ophthalmology is part of the University of Virginia School of Medicine. The Department of Ophthalmology, in conjunction with the University of Virginia Medical Center, operates two (2) fully-equipped clinics. 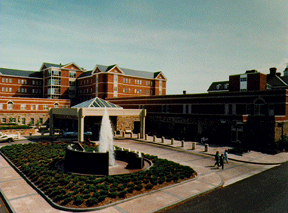 The UVA Clinic is in the Old Medical School Building and is part of the West Complex of the Health System. The UVA Clinic was recently expanded and now consists of twenty-four (24) exam rooms and several procedure and testing rooms. The Northridge Clinic is set away from the Medical Center on Ivy Road. 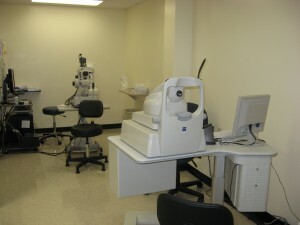 The Ophthalmology Clinic at Northridge consists of ten (10) exam rooms and several procedure and testing rooms. Both locations operate five (5) days a week year round. Most faculty and clinical personnel split their time between the two (2) locations, while all of the administrative offices are adjacent to the UVA Clinic. We are proud to serve as the ophthalmic referral center for central and western Virginia as well as parts of West Virginia, North Carolina, and eastern Tennessee. The mission of the Department of Ophthalmology is to provide our patients with quality, state-of-the-art ophthalmic care in all sub-specialties of ophthalmology. We pride ourselves in furthering knowledge of eye care through medical training and research. UVA Ophthalmology has cutting-edge equipment and facilities to provide the best possible care to our patients. Macular Function Lab with OCT/SLO instrumentation. On-line terminals connecting to ophthalmic discussion groups through the Internet. 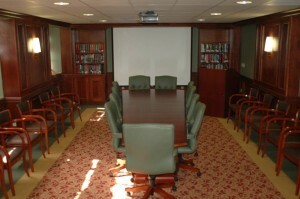 Our library is augmented by the Health System’s Claude Moore Health Sciences Library, the core library for the region, which has state-of-the-art audio visual and teleconferencing capabilities. Four (4) operating room facilities provide ample access for surgical experience and optimal patient care. This facility has the latest technology in phacoemulsification. Subspecialty surgery including cornea, glaucoma, oculoplastic, pediatric, and orbital surgery is also done at OPSC. This procedure room is located within the Eye Center where is it easily accessible for minor procedures and emergencies. This unit is equipped with three (3) thermal lasers, a Trans-Pupillary Thermal Therapy (TTT) laser, Photodynamic Therapy (PDT) laser and a YAG laser. The research laboratories are located in Biomedical Engineering and the Ophthalmology Department. The Ophthalmology Research Laboratory is run by Paul A. Yates, M.D., Ph.D. and focuses on both translational and basic research into the development and refulation of retinal blood vessel growth which leads to many eye diseases such as retinopathy of prematurity, diabetic retinopathy and macular degeneration. We are interested in creating new approaches for treatment of these blinding diseases. Current projects are investigating stem cell therapies for retinal disease, the role of ephrins in blood vessel growth, and creating novel light activated drugs for treatment of retinopathy of prematurity and macular degeneration. Basic research in the lab is also examining the molecules that control vascular branching, as this is a key step in the progression of abnormal blood vessel growth which causes many retinal diseases. This research involves multiple collaborations with the Department of Biomedical Engineering at the University of Virginia which has world renowned expertise in microvascular development. Research is also ongoing on the growth, patterning, and branching of retinal ganglion cell neurons which connect the eye to the brain. Many of the same molecules that contribute to retinal blood vessel growth also similarly control retinal neuronal growth and we hope to identify common mechanisms between the two (2) systems. Our hope is that understanding this process will one day permit successful eye transplantation. At the Veterans Administration (VA), located in Salem, Virginia, our faculty members collaborate with residents on the surgical and medical management of the VA population, including cataract, glaucoma, and other routine surgeries.